Trade Idea: ECB Decision to Push EUR/JPY Down? I’m counting on Dovish Draghi to step up to the podium today and cause a selloff for the euro. 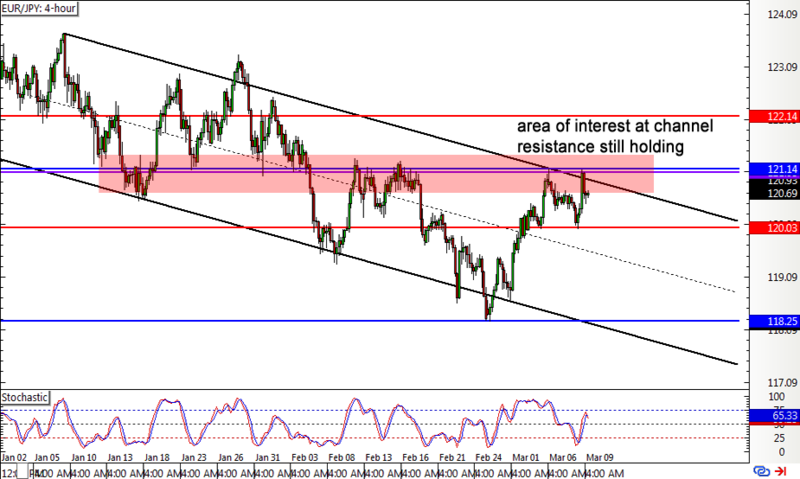 That’s why I’m trying to get a piece of the action with this EUR/JPY channel setup. As I’ve noted in my Weekly Watch, this pair has been moving inside a descending channel formation visible on its 4-hour chart and is hovering around the resistance. Price made a bit of a bounce off the previous week high but found support at the bottom WATR and pulled right back up to the 121.00 area. Recent economic reports from the euro zone have been mixed, as German factory orders indicated a sharper than expected 7.4% slide versus the projected 2.5% drop while German industrial production printed a 2.8% rebound from the earlier 2.4% slide. Prior to this, the retail PMI showed a return to industry contraction while the Sentix Investor Confidence index ticked up from 17.4 to 20.7 to show stronger optimism. Still, I’m thinking that ECB Governor Draghi could downplay any developments once more as he did so in the earlier central bank statement. At that time, he brushed off the pickup in inflation as temporary and maintained that the Governing Council is ready to ease further if necessary. He even added that growth in the region could be dampened by the slow pace of structural reform. However, some analysts still believe that the ECB could move closer to tapering asset purchases this time around or at least indicate that they’re no longer looking to cut interest rates. Either way, the accompanying press conference to the actual statement could contain a lot of fireworks so I’m gonna need a wide stop on this one. As for Japan, economic data has mostly been stronger than expected recently, except for the current account balance. The final GDP reading for Q4 was upgraded from 0.2% to 0.3% while average cash earnings picked up by 0.5% versus the 0.3% forecast, signaling stronger consumer spending later on. This should be enough to keep the BOJ confident about its current monetary policy stance and refrain from making drastic changes in their announcement next week. Short EUR/JPY at 119.75, stop loss at 122.25, profit target at 116.25. I’ll be risking 0.5% of my account on this setup for a potential 1.4-to-1 R:R.